Joan Crawford vs. Mario Vargas Llosa on Straight-Jacket? | personal.amy-wong.com - A Blog by Amy Wong. 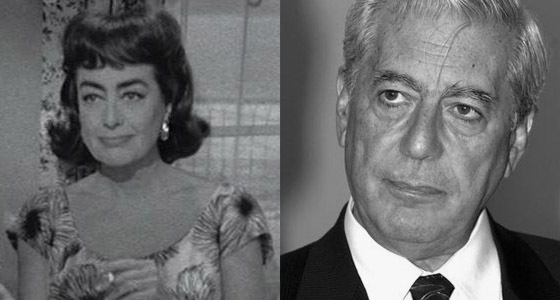 Joan Crawford vs. Mario Vargas Llosa on Straight-Jacket? I was watching my newly-purchased copy of Strait-Jacket with my father, having a blast — seriously, that movie is a hoot! Can’t really wait to take a look at the extras, and see Ms. Crawford with that ax. But then, almost at the end of the film when Crawford is wrapping up, my dad goes on and says “Look, it’s Mario Vargas Llosa!” Freezing the image, we burst out laughing. do you see it? I mean this photo of Crawford in the film isn’t really it. You must see her with her not-a-wig hair from where she is normal. It’s uncanny.